Bruce George is a keen cross-country skier. 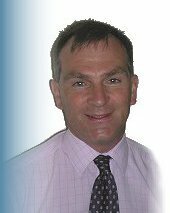 He took up this sport in 2002 and has taken part in the Engadin ski marathon in Switzerland every year since then. 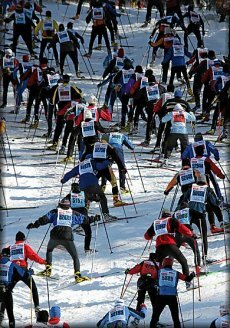 In January 2007 (www.engadin-skimarathon.ch). 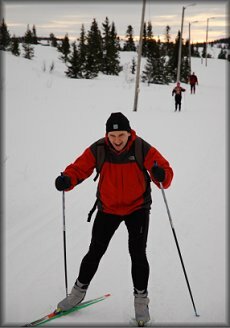 He organised a one week medical cross-country skiing conference in Norway, in conjunction with Nordic Challenge (www.nordicchallenge.com). The conference included two hours of medical lectures/interactive tutorials each morning of general medical/surgical interest. 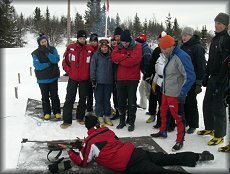 The remainder of each day was spent cross-country skiing or learning the subtle art of biathlon, under the guidance of three experiences Nordic ski instructors. If you are interested in next years course contact Bruce George (brucegeorge@doctors.org.uk) or the Nordic Challenge team (ski@nordicchallenge.com). Climbing a hill during the Engadin ski marathon Oxford anaesthetist getting to grips with cross-country skiing during the Oxford Nordic cross-country skiing week. Bruce George is also a keen long distance cyclist. In 2011 he completed a clycle from London to Paris in under 24 hours, raising money for OCCTOPUS (www.occtopus.org.uk).